Namangan (also in Uzbek: Наманган) is a city in eastern Uzbekistan. It is the administrative, economic, and cultural center of Namangan Region. 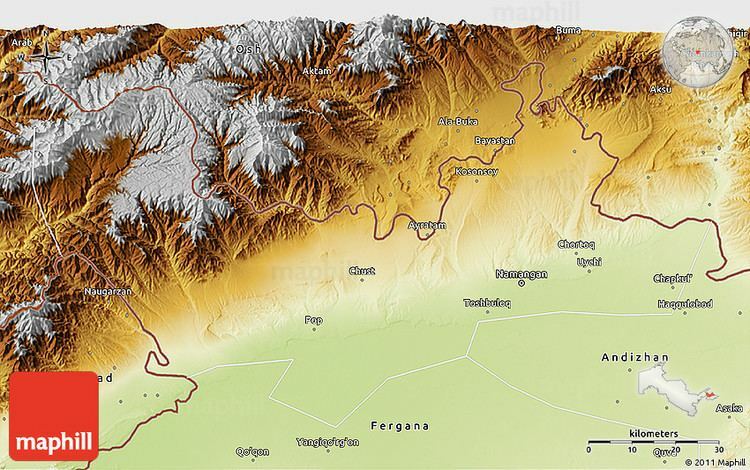 Namangan is located in the northern edge of the Fergana Valley. The city is served by Namangan Airport. Namangan has been an important craft and trade center in the Fergana Valley since the 17th century. A large number of factories were built in the city during Soviet times. During World War II, industrial production in Namangan increased fivefold compared with that of 1926-1927. Currently, Namangan is mainly a center for light industry, especially in food. Namangan is Uzbekistan's second-largest city by population. The officially registered population of the city was 475,700 in 2014. Uzbeks are the largest ethnic group. The city takes its name from the local salt mines (in Persian نمک‌کان (namak kan) — "a salt mine"). Babur mentioned the village of Namangan in his memoirs Baburnama. In his book A brief History of the Khanate of Kokand (Russian: Краткая история Кокандского ханства) (Kazan, 1886), the Russian ethnographer Vladimir Petrovich Nalivkin wrote that Namangan is mentioned in legal documents dating back to 1643. Politically, Namangan became a part of the Uyghur Empire of the Karakhanid State and was known to have been a settlement in the 15th century. The residents of the ancient city of Akhsikat, which was severely damaged by an earthquake, moved to the then-village of Namangan in 1610. Namangan became a city afterward. On the eve of the Russian invasion in 1867, the town had been a part of the Khanate of Kokand since the middle of the 18th century. Namangan, like many other cities in the Fergana valley, was originally populated by the Sogdian people, later becoming a Persian speaking city. The influx of the Turkic people into the region starting in late medieval times led to gradual turkification of the region and the city. However, until the middle of the 19th century, Namangan still had a Tajik majority. Today, the city is an Uzbek speaking city, albeit with a large Persian speaking Tajik minority. Namangan was hit by a destructive earthquake in 1926 which killed 34 people, injured 72, and destroyed 4,850 houses. Since Uzbekistan's independence in 1991, Namangan has gained a reputation for Islamic revivalism, with many mosques and schools funded by organizations from Middle Eastern countries, including the extremist Wahhabi sect from Saudi Arabia that produced jihadist terrorists like Juma Namangani who fought and died in support of the Afghan Taliban and the Al Qaeda. This has also translated into political opposition against the secular government of Uzbekistan. Some women have discarded traditional colorful scarves for large white veils or even the black paranja. Namangan is located 450 metres (1,480 ft) above sea level. The Qoradaryo and Naryn Rivers join together to form the Syr Darya just outside the southern edge of the city. By road Namangan is 290 kilometres (180 mi) east of Tashkent, 68.5 kilometres (42.6 mi) west of Andijan, and 40.4 kilometres (25.1 mi) east of Chust. Namangan has a sharp continental climate with cold winters and hot summers. The average July temperature is 26.3 °C (79.3 °F). The mean temperature in January is −2.3 °C (27.9 °F). Namangan is Uzbekistan's third-largest city by population. The population of Namangan was 475,700 in 2014. Uzbeks and Tajiks are the largest ethnic groups. Namangan has been an important craft and trade center in the Fergana Valley since the 17th century. After annexation by the Russians in 1867, cotton production and food processing became the dominant economic activity, as it did in many other places in the country. A large number of factories were built in the city during Soviet times. During World War II, industrial production in Namangan increased fivefold compared with that of 1926-1927. After the war both light and heavy industries increased significantly. Currently Namangan is mainly a center for light industry, especially in food. There are 36 joint companies and over 400 small and medium enterprises in the city. There are three higher education institutions in Namangan city — Namangan State University, Namangan Engineering Pedagogical Institute, and Namangan Engineering Technological Institute. Namangan State University is the largest, oldest and highest ranked of the three. 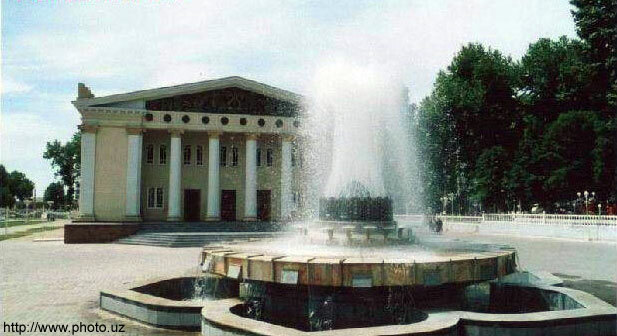 The city is also home to ten colleges, two vocational schools, four academic lyceums (the best one is Dustlik Academic Lyceum under Namangan Engineering Pedagogical Institute), and 51 general education schools. The Mulla Kyrgyz Madrasa (Uzbek: Mulla Qirgʻiz madrasasi) was built in 1912 by a local cotton magnate. 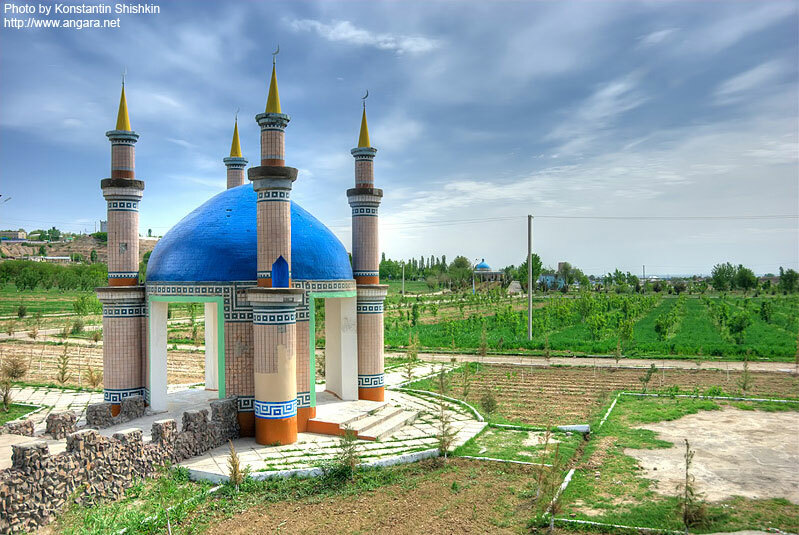 The Mosque of Ota Valikhan Tura (Uzbek: Ota Valixon toʻra masjidi), built in 1918, is one of the largest in Central Asia, now home to a local branch of the Wahabi sect.Olmos city is also has beem accepted to among of landmarks of Namangan city. The Namangan Natural History Museum houses local archaeological finds. The Hadja Amin Kabri Architectural Complex (Uzbek: Xoʻja Amin maqbarasi) has an ornate terra-cotta façade dating from the 18th or 19th century. About 25 kilometres (16 mi) west of Namangan are the Akhsikat ruins, a 1st-century settlement on the Syr-Darya River. Formerly capital of the Fergana Valley, it was destroyed by the Mongols, rebuilt by the Timurids, and abandoned in 1620 after an earthquake. 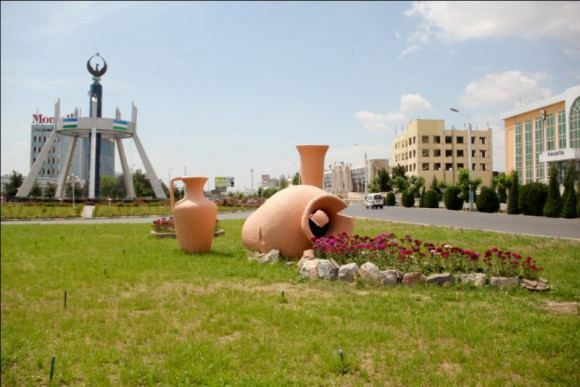 Namangan is served by Namangan Airport which is located 12 km from the city center. The city is also served by a railway station which was built in 1912. Trolleybuses and buses operated in Namangan from 1973 until 2010. They have largely been replaced by public vans (known in Russian as marshrutkas). Mashrab (1640-1711) — an influential Sufi poet. Boborahim Mashrab was born in 1657. He went to Qashqar and increased his knowledge under supervision of Ofoq Hoja. From 1673 up to the end of his life he lived as a tramp. In 1711 he was murdered by hokim of Balh Mahmud Taragay. In M. Namangoniy`s “ Tazkiratul-avliyo”, I. Bogistoniy`s “Tazkirai-qalandaron”, M. Samarqandiy`s “Muzakkiri – ashob”, Hakimhon`s “Muhtabat – tavorih”, M. Olim`s “Ansobus-Salotin” we may find some information about his life and works. The Russian scientists N.I. Veselovskiy, N.S. Likoshin, V.L. Vyatkin expressed important ideas about Mashrab`s creative works in 19th and 20th centuries. Also some specialists in Uzbek literature such as I. Sulton, V. Zohidov, I. Muminov, G. Gulom, A.Hayitmetov, A. Abdugafurov, E. Shodiyev, V. Abdullayev expressed their own opinion about Mashrab’s life and creative activity. More detailed information we find in “Qissai Mashrab” by Pirmat Setoriy. This work has many manuscripts and copies. Usmon Nosir (1912—1944)- The talented poet Usmon Nosir who entered the Uzbek literature of the 20th century as a thunder and lived a very short creative life as a lightning. He was born on November 13, 1912, in Namangan. Writing books from his childhood his creative work extended only 15 years, until the time he was put in prison. In that period he showed his rare talent. Young poet’s books as “Quyosh bilan suhbat” (conversation with the sun) (1932), “Safarbar satrlar” (mobilized lines) (1932), “Yurak” (heart) (1935), “Mehrim” (my loving) (1935) were published at that time. In 1937, on July 14, with the slander "the enemy of the people" he was put in prison first in Tashkent, Magadan and in Kemerovo. Being exhausted in the prison he died in 1944, in Kemerovo.